Having Info Windows in a Google Maps is a powerful way of displaying information about a specific point or object. Did you know that there are several kinds of them? In this article I will show you how to add different kinds of Info Windows that appear when you click on a marker. The key method for opening an info window when clicking a marker is GMarker.openInfoWindowHTML(). It takes two arguments, first the text that will appear in the Info Window and secondly an optional object literal containing options you might want to use to configure the Info Window. To learn more about the available options, see Options further down the page. In the examples for this article you have to click a marker to open the window. This is done by using the GEvent.addListener() method. I will not describe exactly how it works in this article but if you’re unfamiliar with it you can read more about it in the official documentation. This code will result in an ordinary map showing a marker which, when you click on it, pops up an Info Window. If you have a lot of information about each marker, more than you can fit inside a normal Info Window, you could use an Info Window with tabs. You simply define each tab as a GInfoWindowTab and add them to an array that you later on add to the marker using the openInfoWindowTabsHtml() method. The result is a tabbed Info Window. The API features an easy method to open up a mini map over the area where the marker is located, showMapBlowup(opts?:GInfoWindowOptions). This method takes an object literal that have two possible parameters, InfoWindowOptions.zoomLevel and InfoWindowOptions.mapType. These lets you determine at what zoom-level the mini map should start and what map type it should show. You never thought it would be this easy to do this, did you? If you have a lot of content to show in you Info Window it could be useful to let the user maximize it. This is easily done using the options maxContent and maxTitle. If you define these you will automatically get a maximize button in your window. So to make this work just do like this. When you first click the marker an ordinary info window will pop up. When you click the plus sign (+) in it, it will maximize. As I’ve mentioned earlier each of the methods that opens an Info Window takes an optional object literal with options. The properties you can use in it are defined in the GInfoWindowOptions class. All properties doesn’t comply with all kinds of Info Window. Determines which tab should be selected when opening an Info Window. Starts with number 0. Sets the maximum width of the info window. Note: From my observations it seems that the minimum value for this is 249 pixels. Sets if the info window should be closed when clicking inside the map. Default value is true. A function that is called after the info window is opened and the content is displayed. A function that is called when the info window is closed. Determines what zoom level an opened Mini Map should have. Only applicable with showMapBlowUp(). Determines what map type an opened Mini Map should have. Only applicable with showMapBlowUp(). Determines what content should be showed when an info window is maximized. It can be either an HTML string or an HTML DOM element. Sets the title for the window when it’s maximized. It can be either an HTML string or an HTML DOM element. Specifies a number of pixels to move the info window away from the current GLatLng. The options are passed to the method in an Object Literal. Here’s an example of using the maxWidth property when opening a basic Info Window. Info windows are a powerful way of displaying information about certain objects in a map. In this article I have showed you some of the basic ways to use the built in ones in Google Maps. I think you can go a long way with these techniques but if you have special needs there are third party extensions out there that you can use. It’s beyond the scope of this article to describe how they work, but the first library to check out should be ExtInfoWindow, one of the open source utility libraries for Google Maps. You’ll find documentation and examples at Google Maps API Utility Library. Joe Monahan has also written some about it on the Google Maps API Blog in the article ExtInfoWindow 1.0: Ajax powered, CSS customization. Mike William at Google Maps API Tutorial has described two other libraries in the tutorials Using the EWindow extension and Using the EBubble extension that also might be useful. Praise GMaps, and praise you for the articles! Great! Can I link to this from the docs? How can I use openInfoWindowHtml and showMapBlowup both at a time? Or is there any way that I can display information (which I am displaying on openInfoWindoHtml including maxCOntent also) on showMapBlowup, Is this possible? kv: Have you looked at the demo of this? You should be able to just copy the code from that and get it working. Don’t forget that you need your own API-key. OK, how in the world do i get the info window to show on load? Just make sure that you do this after the marker have been added to the map. I’ve set up an example to illustrate how this is done. Does anybody know if there is a way to style the text within a maximized info window? I am using jQuery to extract things like ‘title’ ‘address’ and ‘info’ from an html document and setting them to variables that I am passing into the maximized info window content. I want to change the color of the font and ad breaks but nothing is working for me. Brian: It’s easy to give the content of the maximized window a certain style. Just wrap the content for the maximized infowindow inside of a <div> and give it a class name. Then in your stylesheet you simply define it’s style. I’ve made an example page that you can check out to see how it’s done. Great sites. I have one question about those info windows. Some problems what I have found; Data goes in same window and doesnt show in separate info windows where those supposed to be. Thanks if you found answer. Can I put marker.showMapBlowup() in one of the tab? thank you for your blog, is very helpful. I would like to know if it is possible to make info windows with multiple tabs in “My Maps” in Google Maps, ¿how to do that? I have created tabs in the info window when it is maximised but am unsure how to insert pictures into a specific tag, could you please help? I hope that this answers your question! how can this method be implementable with using a KML file? WoW… this is really well explained. Much better than the “official” site. Have a question about the maximized windows. I find that the info window is to small for what i want and the maximized info window is that bit to big. Can the size of the of the maximized window be controlled either in height or width. Would be very thankful for any help. Adrian: I don’t think that you can control the height or width of the maximized info window without some serious hacking. But you could change the size of the non-maximized info window by setting styles that defines the dimensions on the content inside of it. Best practice is to set it using a class and defines the dimensions in a separate style sheet. This is a seriously great site, hope you keep it up, it answers so many questions in a understandable fashion. the showMapBlowup() works great in V.2. Does it work in V.3 and how ?? Please shed light! Ay: There’s no native method in V3 for doing a MapBlowup() but it’s entirely possible with a little bit of coding. That’s one technique I will show how to do in my upcoming book on V3 of the API. Any way to position the infowindow relative to the position its pointing at so that the window can be made to appear “below” if the position is near the top of the map or “above” if the position is near the bottom of the map. This seems to happen in Google Earth, and would prevent the map from autoscrolling to get the infowindow on the displayed area. Geoff: Check out the pixelOffset property of the GInfoWindow object. It enables you to offset the InfoWindow from a given GLatLng. I am trying to get clearbox 3 which is a picture display js it is like slimbox 2. I have it in a var for a inforwindow. click on the url and you get tabbed infowindows for each marker. the photo tab is the one. but mostly my question is if i need to trigger the js some how. the clearbox works fine as a stand a lone html page but not when it is in the gmap infowindow. any thoughts? 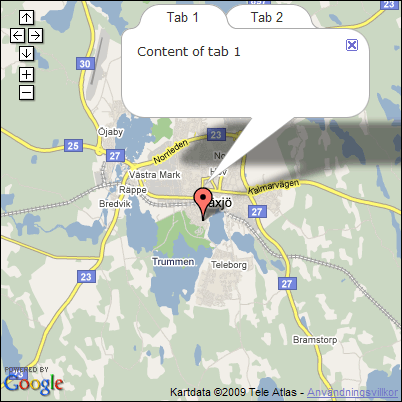 InfoTabWindow: I’like to display an image and some text in tab1, mapBlowUp in Tab2. How can I do that?Thanks. appreciate the initiative from google to enable us customise maps. i was wondering if there is a way to add several eventlisteners which open individual info windows filled with content from the array with a for loop to the created markers with the same loop? WoOW dude, I gotta hand to you … I have been cracking my skull open trying to get the Info Window to open and always got a problem … but after I got a look at this article things went totally smooth … thanks a lot! Doesnt seem to work as described above. Any ideas anyone? How can I use openInfoWindowwith tap and showMapBlowup both at a timefor one marker. 2- I need to have three different tab, one of them with show the mapblowup, the second one with show some text and photo and third one will show a video clip from YouTube. please let me know if anybody can help me on this. Is posibility have InfoWindowHtml to polygon or Tooltip ? I am using gmap in drupal and want to use the above functionality. I assume that i have to add the code to a .js file??? If so which one?? Looks like its exactly what i am looking for just need a little guidance on where to edit and paste !!!! excuse me but I was wondering if this tutorial work in the v3 of google maps? argenis: No I’m afraid not, it’s for v2. You can check out my article Google Maps API 3 – InfoWindows for some information on how to use InfoWindow in v3. Hello I am trying to get good maps to display the maxWidth to fill the maps but It keeps doubling the size of the maps width. Would you know how to help that problem so the max popup will display correctly? attributes to these marker. Thank you very much indeed. 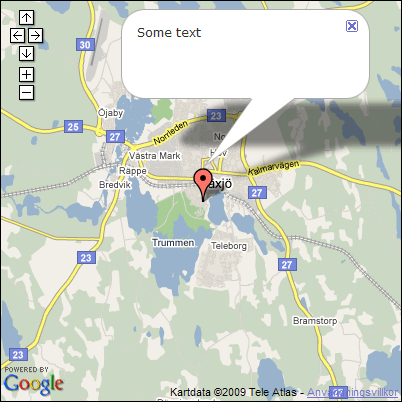 I’m working on a WordPress-plugIn with GoogleMaps. I use tabbed info windows. but there are some grafical problems: the info windows show up without tabs, the tab header shows up on top of the info window somewhere in the map, the right corners of the info window is missing. Do you know how i could make it look correctly? How to set de minHeight of the box? hello, the first i’m sorry for my english. I have a window with GinfoWindow an HTML form, and I want to get them information in this form. Some idea? http://maps.google.com/maps?q=london&iwd=1, where iwd is the window parameter but it is not getting opened. Kindly help me with this. Thank you for your article! It was usefull, but i’d like to make a map where info windows are always shown (to see the name of my objects). Is there any way to do it? Hi Alex. You should really look into Google Maps API 3 instead. Version 2 is abandoned by Google. Check out the article http://www.svennerberg.com/2009/09/google-maps-api-3-infowindows/ which describes how to use InfoWindows in v3 and to do exactly what you want to do.